A few months ago, I sat across a table from a four-year-old named Thomas. He and I were waiting on his dad who was in the gym coaching my son and the rest of a high school church league basketball team. I had some paper and markers, so we began to draw. Thomas drew his brother, where he lived, a mystery map, the gate to his house, the family car, his mom, his dad, a basketball, a fish in the water, and much, much more. Did I know this because he was a gifted illustrator? No, I knew these things because he talked about each symbol as he drew them. Thomas and I conversed on many things during our time together. As he drew, he explained, described, defined, and analyzed his drawing, often critiquing my drawing as well. I learned a lot about him that evening, and we became friends. As our time drew to a close, I told Thomas what an amazing artist he was. His response was, “I know. I’m a genius.” You may laugh, but you weren’t there. I was, and I believe him. You see, I’m a high school art teacher. I see kids every day like Thomas who probably thought they were geniuses, too, until our current education system taught them they aren’t. Why is this? Why don’t my high school kids with amazing creativity and imagination see their “genius”? The answer may lie in how we, in today’s educational culture, define “smart.” I sit through hours of faculty meetings looking at PowerPoint charts and graphs of testing data knowing my students’ many gifts aren’t represented by any of the information on those screens. Are you only smart if what you know can be tested? Is smart a certain number on an ACT test? Is smart so narrowly defined that we ignore the genius inside those kids who have artistic abilities most of us only dream about? Kids are smart. They know that when something is important, we spend time and money on it. Did you know that elementary students in the Jackson-Madison County School System receive only two hours of art instruction a month? In middle school, six to nine weeks at the most. Of the students who arrive in my Art I class, most don’t know the basics of a color wheel, the names of more than one or two artists, or how to speak in any articulate manner about the millions of visual images they view in a single day. While math and science programs are funded by billions of dollars across our nation, arts education receives only a small fraction of that amount. At Jackson Central-Merry (JCM), my yearly art budget allows for $7 to $10 per student per semester—about what most of us spend on lunch. Like most teachers, I often supplement my art budget out of my own salary because I truly believe that what I do and what my students do is important. I am perplexed by why our schools receive so little support for arts education. We know that school systems that show great academic gains give strong support to the arts and realize rigorous and intentional instruction in the arts benefits all students in all areas of study. Research tells us that students who are involved in the arts on average have higher ACT and SAT scores than students who are not. We also now know that schools with strong arts education programs show the most gain in schools populated by low-income students. For obvious reasons, children who are raised in affluent homes are often exposed to the arts much more so than low-income students. By not offering high quality arts education instruction in our schools, we create even wider gaps between the haves and the have-nots. I was lucky. While by no means affluent, my parents were educated and knew the importance of the arts to our overall development as well-rounded and knowledgeable citizens. We visited museums, were taken to operas, ballets, plays, and concerts. My mother kept a closet in our home full of art supplies along with games, sports equipment, and (my favorite) dress-up clothes. My imagination and desire to create was strongly nurtured and encouraged. I later chose art as a major in college with the complete support of my parents. As I raise my own children, I have tried to follow their example, and my children have benefited as well. But most parents and many teachers today think of the arts as a frill, as something fun to break up the real work that happens in academic classrooms. 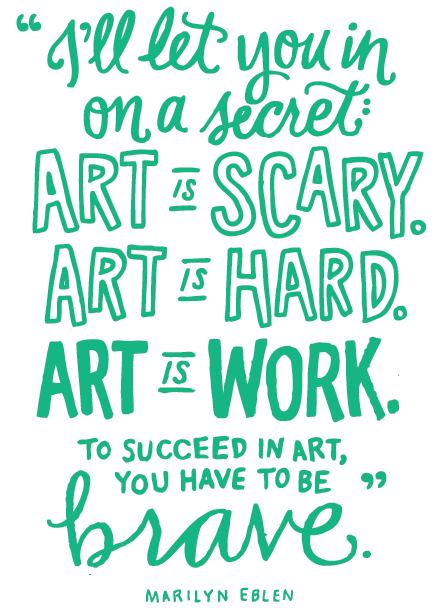 I’ll let you in on a secret: art is scary. Art is hard. Art is work. To succeed in art, you have to be brave. Think about it. You can work on an English paper or a math assignment and few people other than the teacher know if you are doing well or not. In an art class, your success or failure is up front and present for all to see. A blank canvas or sheet of drawing paper can be the most intimidating thing in the world for a student. Everyone is going to know if you have what it takes or not. 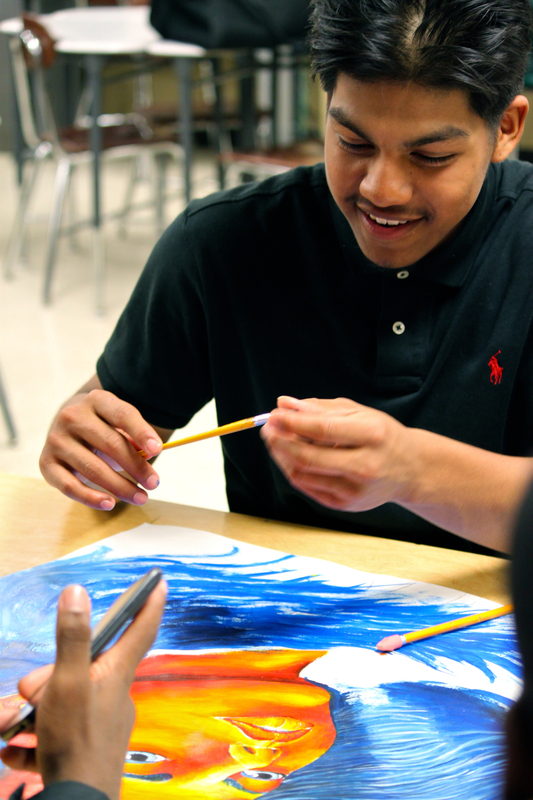 In art class, we teach students to face those fears and jump in with both feet. We train for success, but if failure occurs, and it does, that failure becomes our best teacher. We often use the term “happy accidents” because sometimes our mistakes result in our best work. Art also has a distinct language, as do most fields of study. Not only do we teach our students to draw, paint, make prints, and pottery, we teach them to speak and write about what they see, experience, and create. We introduce our students to the great masters of art who, throughout history, have changed the way we see the world. Through our study of art and artists, we also learn about the time and place in which the artist lived and produced art. Today we discussed the painting Bedroom at Arles by Vincent van Gogh. As part of our critical analysis of the painting, I asked the students why they thought van Gogh painted such a simple painting of his bedroom. A student responded that he didn’t think van Gogh’s bedroom was really that orderly in real life, but that he painted it that way as a means of calming himself because his personal life was so chaotic. He thought the painting was a metaphor for what van Gogh desired, not what he had. I was floored. I had never seen that painting in that light before, and I will never see it the same way again. I secretly smile when I see a student slip out their phone to take a picture of their completed artwork. I cheer when a student tells me they had a writing prompt in English that asked them to write about an image, and they could do it because of our “boring Art Criticism” assignments. (They are teenagers.) I tried not to giggle when a high-achieving student complained that chemistry was easy but art is hard. I ran into a former student a few years ago who said, “Hey, Mrs. Eblen, I’m still using my art. I’m a barber!” I loved that he made that connection! So, to all my kids courageous enough to be artists, to Jasmine, to Robert, to Kamesha, Rodrigo, Briana, Hailey, Pablo, Pavan, and Anthony, and every kid that walks in my door, I am humbled to be part of your journey. You are on your way to something amazing. I know this because I believe you are a genius. Marilynn Eblen has taught Visual Art in the Jackson-Madison County School System for fifteen years. She also taught as an adjunct Art Education instructor at Union University for eleven years.